Interested in booking one of our photographers for a personal event photo shoot, or PEPS? 1. Right-click on the image and select "Open Image in NEW Tab." 2. Print from NEW browser tab. b. Picking up Sign-Up sheet from Vince or Jeremy at the Meet. 2. 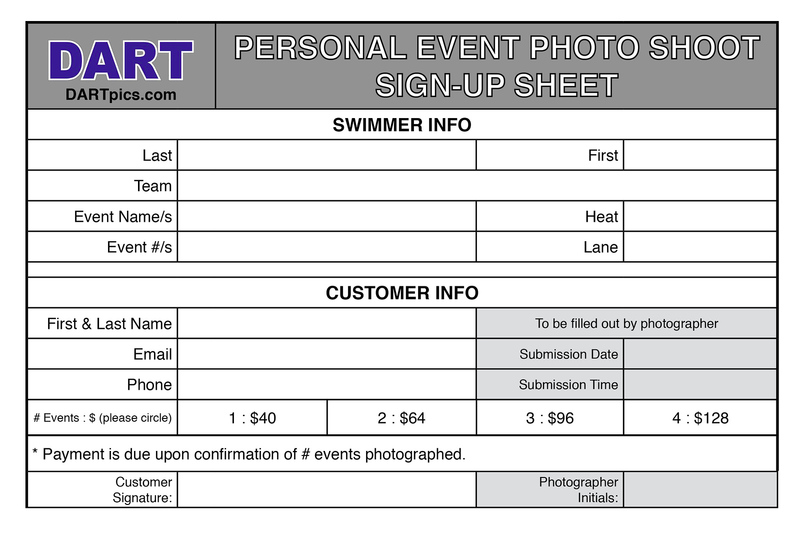 Completely fill out sign-up sheet when you know your swimmer’s heat and lane assignments. If you don't know heat/lane assignments, make sure to submit at least swimmer first/last name and event name and number. You can sign up for more than 1 event, but we cannot guarantee that all events will be photographed. 3. Submit form to Vince or Jeremy either in person or by emailing scan or picture of completed form to support@dartpics.com. If there is a scheduling conflict, they will follow a 1st-come-1st-serve basis. 4. Enjoy your swimmer’s race and cheer loudly! 5. $40 fee covers photo shoot for single event + minimum of 2 hi-res images of your swimmer. Payment is due upon receipt of photographer-signed sign-up sheet, confirming that photographer was able to capture your swimmer’s race. Events photographed will be marked, determining total price. Check (payable to Davis Aquadarts) or cash will be accepted. 6. You will receive email notification when your images are ready for viewing.